Today, once again, we’re bringing you a spectacular deal on athletic equipment — leaving no reason for you to slack on that goal you set to get in shape. 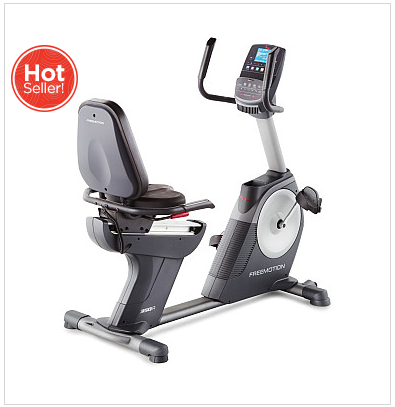 Popular athletic store Sports Authority is offering the FreeMotion 350R Recumbent Bike for $499.99 (regularly $999.99). That’s half off (a savings of $500)! The recumbent exercise bike includes 22 levels of resistance, a cooling fan, bottle holder and weight capacity of 350 pounds. It can also track your heart rate and the number of energy calories you’ve burned. The deal is part of the store’s Clear the Gear discount event, with savings of up to 70% off original prices. With thousands of items on sale, even if this particular bike doesn’t seem like your kind of ride, there may be something else that fits you. Shop this deal at Sports Authority.